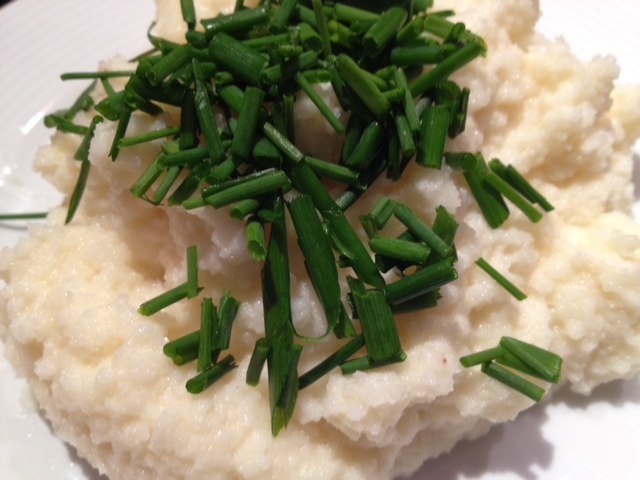 These cauliflower mock-potatoes are a great substitute for regular mashed potatoes. Cauliflower is low in carbs and high in fiber, so you can eat these without any guilt! You’ll swear you’re eating the real thing. I served them up with a simple steak, but they’d go great with chicken or fish, too! Enjoy! 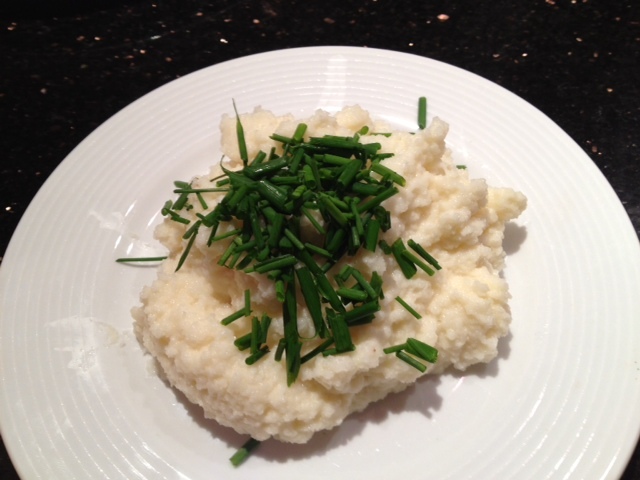 Chop the cauliflower into small pieces and boil it for approximately 7-10 minutes or until soft. Drain the water and put the cauliflower into the food processor. Blend until the consistency is smooth and all of the lumps are gone. Add the milk, sour cream and parmesan and blend again to mix. Heat a pot on low heat, and add the light butter. 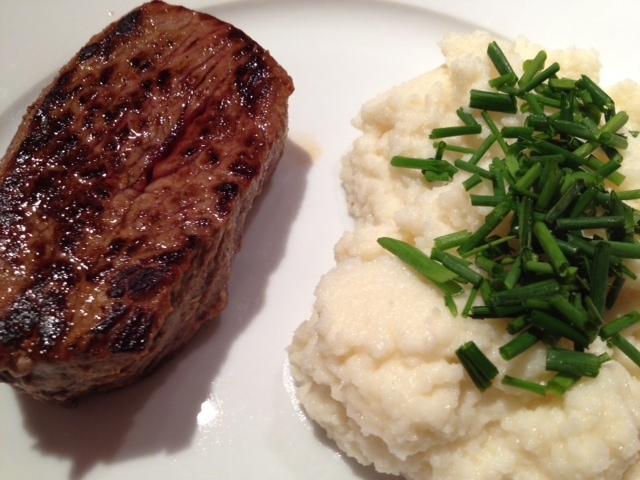 When the light butter has melted, add the cauliflower puree mixture and sprinkle a dash of garlic salt and black pepper. 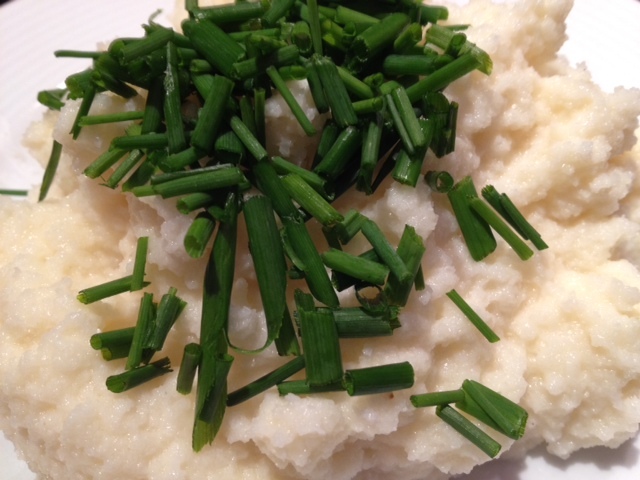 Top with fresh chives before serving. In a mixing bowl, mix red wine vinegar, Dijon mustard, crushed garlic, garlic salt and a dash of hot red pepper flakes. Put the steaks into a large ziplock bag and pour the liquid in. Allow the steak to sit and marinade for 1 hour. Heat 1 tbsp olive oil in a pan on medium-high heat and then add the steak. Put the lid on and allow the steak to brown for 5 minutes. Then repeat on the other side of the steak. Remove the pan from the heat and keep the lid on, allowing the steak to sit for 5 minutes. 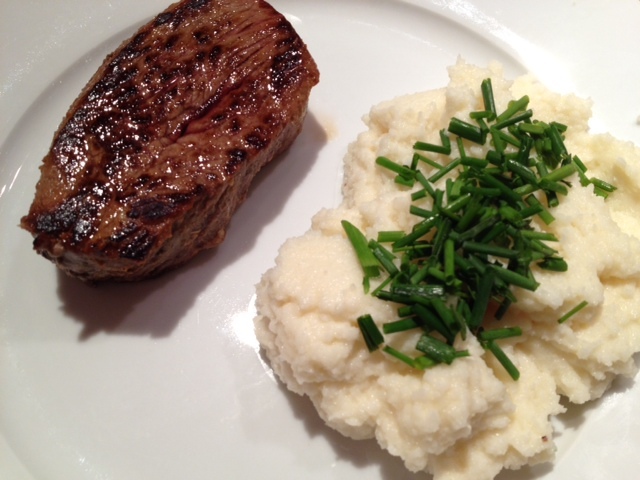 Depending on the thickness of the steak, it should be cooked to a medium color inside. ← Mac & Cheese, Please! This is similar to what we made you and Gareth one time – Yum! I really like this one cuz it looks so high caloric but it isn’t and it’s good for you – very sneaky!